Despite the multitude of articles and blog posts talking about how you can be that parent who miraculously potty trains their toddler in just one weekend, potty training is largely out of your control. I know, I know, that’s literally the last thing you wanted to read, but hear me out. Potty training is less about how you do it and more about when you do it. 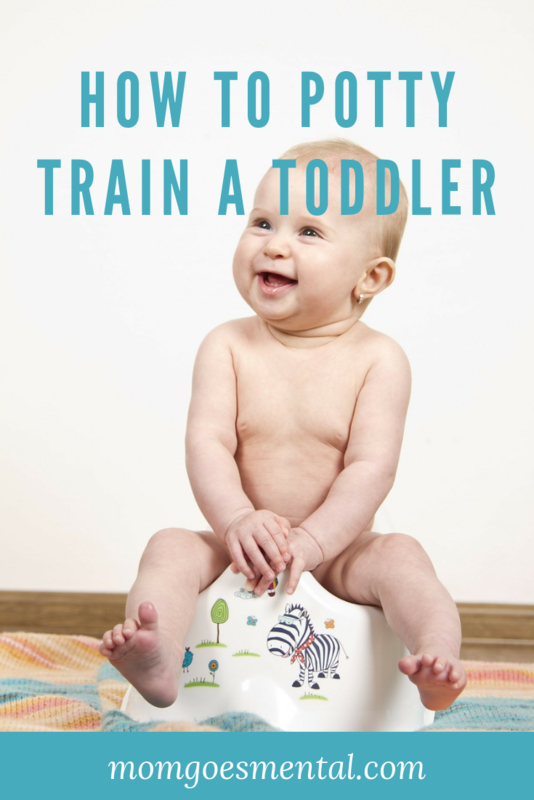 The best time to start to potty train a toddler is when they begin to show signs of readiness—essentially, signs that they are developmentally capable of controlling their bladder and bowel movements. As a veteran mom and former nanny, my best advice for parents trying to potty train a toddler is to relax. Stop worrying and stop pushing. It will eventually happen to every child in their own time. The best thing you can do as a parent who is anxiously waiting for diaper-free days is to watch for signs of readiness and encourage potty training when you start to see those signs. In my experience, one of the first signs that you’re ready to potty train a toddler is their hatred of dirty diapers. While this may not be true of all children, many toddlers who were previously content to sit and play in a soiled diaper are no longer so content. They may become generally fussy when their diaper is soiled, avoid sitting in it, or actively ask to be changed. What You Can Do to Encourage This: I’ve found that changing my kids’ diapers as soon as they’ve soiled them helps to reinforce that clean underpants are the ideal. I regularly make unpleasant noises about a dirty diaper and positively reinforce how great it feels once they’re clean. If your child is announcing their bodily functions, proudly talking about how they just peed or are currently pooping (thanks for announcing that in the middle of Target, kiddo), there is a good chance it’s time to begin potty training. Less outspoken children may instead develop rituals like retreating to the same corner or closet to do their business. What You Can Do to Encourage This: talk to your child about their bodily functions and reassure them that these are normal. Invite them into the bathroom with you—I mean, it’s not like they aren’t either already there or just on the other side of the door anyway—and talk about pushing their poop or pee out into a potty when they are a big kid. I’ve also found that using action words like push often leads to better results than words like go. Finding yourself changing less wet diapers may be a sign that your toddler is ready for potty training. Usually, you’ll find your child has dry diapers for about 2 hours at a time, and according to KidsHealth, this typically starts happening between 18 and 24 months. There is some mythology that boys are typically younger and girls can be harder to potty train, but really it’s all up to your individual child. Not only is a regular bowel movement schedule a potty training sign of readiness, but it can also make potty training a toddler much easier. If your child begins soiling their diaper on somewhat of a schedule, it may be that time. What You Can Do to Encourage This: once your child is eliminating on a schedule, you can begin timing your potty training to that schedule. Know your child poops in the morning? Make bringing a potty book into the bathroom together and sitting on their new big kid potty part of your morning routine. Then positively reinforce the time they spend there and reward any successes. Your child will have the most success learning to use the potty the more independently they can dress and undress themselves. When you think about it, the ability to pull up their pants or remove a diaper, pull-up, or underwear is an essential part of their elimination experience. Being able to dress and/or undress themselves is a huge sign that your child might be ready for potty training. What You Can Do to Encourage This: encourage your child to take part in their daily dressing. It might start as part of their diaper changing process like, “Okay, let’s stand up now. Help mommy pull up your pants!” Then it may progress to encouraging them to disrobe themselves before stepping into the bath. Once your toddler is actively showing these potty training signs of readiness, it’s a good bet that potty training can begin and continue fairly successfully. Remember that every child is on their own schedule and what takes one child a weekend to master may take another just a few days. It’s not a race to the finish, and positive experiences with potty training lead to more success. Start using family words for bodily functions early. Words like “poop” and “pee” or “defecate” and “urinate” should be introduced to explain your child’s bodily functions as early as possible. I started using them each time I was changing diapers as early as 6 months just to help myself get into the habit. By the time baby #3 came along, these words were just part of regular family conversation. Bring your child with you to pick out a special potty. Make it a coming of age type of event, and allow your child to choose where they would like to go as a big kid. Make choosing big kid underwear or pull-ups a big deal! Allow them to choose their special undergarments and encourage them to be excited about the process. Explain that accidents are completely okay. Try not to react to accidents with disappointment or anger, as these reactions can lead your child to cling to their familiar diaper as a way of avoiding invoking negative emotions in their parent. Try going naked! I’ve specifically started potty training in the spring so that by summer we could go naked. Once my toddlers knew the basic mechanics of how to control their urine and bowel movements, we would often have naked days at home where my toddler would go about their day in just a t-shirt. Not feeling anything to “catch” their accident was sometimes great motivation to stop playing and run to the potty. Make going to the potty a fun game. We would laughingly run to the potty together whenever one of the kids announced their need to go, and successful attempts were rewarded with a sticker. Once they earned 5 stickers, we would take a trip to the library or other special place. Reading can also be a great way to potty train a toddler and get them familiar with potty training lingo and processes! Here are some of my family’s favorite books on potty training. The journey to potty train a toddler begins with watching for potty training signs of readiness and ends somewhere on the intersection of the roads named Patience and Trial and Error. Everyone’s journey is going to look a little different, but don’t beat yourself up after reading those weekend potty training success stories. It’s a learning process for you and your toddler, and every child is different. Glad I came across this! Our boy is 26 months and we have a 2nd due in June. Really hoping to only be carrying around one diaper size this summer! We’re feeling similarly! Our baby will be nearly 2 when our next is born, and we’re looking forward to starting potty training next year. Only one baby in diapers is definitely the ultimate goal! Oh yesssss! I wish I had read this many years ago, when my well-past-3-year-olds had been showing all the signs of readiness, and actively trying of their own will to work on this, for over half their lives! We tried EVERYTHING to encourage this, and NOTHING worked til we put them in a dress with nothing else on. Yes! That’s my absolute favorite trick in the book. Once my kiddos had a good grip on what to do, going without pants really helped because they could feel it happening right then, stop themselves, and run to the potty. Magic!